He is such a powerful horse. When I saw his expression the day of his birth I knew he was a strong character and came to bring me many challenges. His ears, when he was little, resembled two antennaes that would detect every energy shift in his surroundings. So if something was not in harmony in my energetic field he confronted me with it, and in such a way I was not able to escape from it. But he also has this beautiful intense way of loving his fellow herd members, including me… This is how I perceive myself when I am with my herd, as one of them. And I am very aware that they are teaching me how to become truly one of them. You know what and where things went wrong and you are able to help others who are going through a similar process. And this is why we are here: to learn, to help one another out and to share. Horses, and other animals, are here to help us have experiences and they are willing to forgive us for our mistakes. Especially when they know your heart is pure and you have the best intentions. It can become problematic when we refuse to forgive ourselves and keep our hearts closed. When we stay in our head and project our mind onto our horse. They do not judge, they only respond. When you keep your heart closed, it is impossible to feel how loving your fellow horse is for you. So be brave and dare to feel. The true warrior is the one who has an open heart and dares to be vulnerable, the one who is in peace with himself: accepts his flaws and is willing to learn from his surroundings that merely reflect his inner being. A part of our growth as beings is that we need to overcome the fear of our own power. This is what Amal is teaching me. He is challenging me with his powerful and strong will and is teaching me how to stay in tune, in connection, while he is showing me his power. How can I stay in my heart when he is prancing and boxing at me… He asks me: Are you going in your fear and push me away? Or are you going to stay put and hold our space? The major challenge when fear comes up is to keep your heart open. When you are confronted with your own fear, there is this mechanism that almost automatically kicks in and that is to close down. You block out that what makes you fearful, but in the same time this block that you have created is that what keeps you in fear. When fear comes your way it is beneficial to go through it. Stay open and be vulnerable, let all your emotions come up and express them without hurting your horse friend. 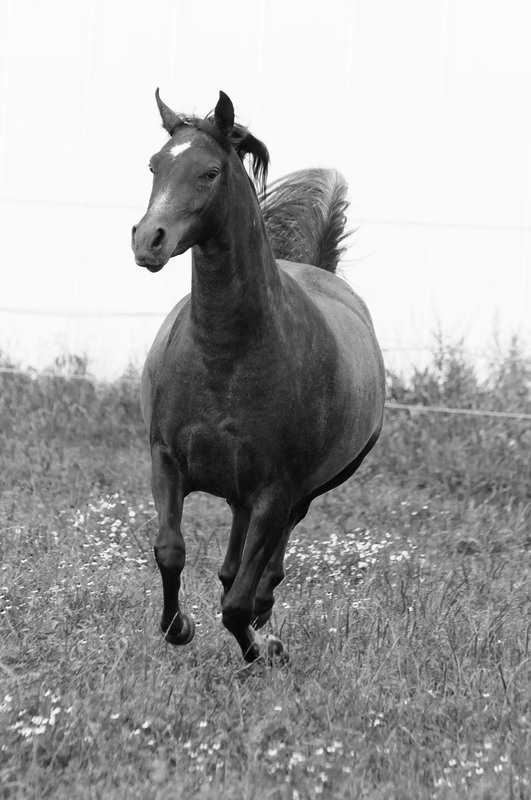 Your horse gets hurt when you use him as a means to act-out your emotions. It is better to let your emotions come up and share them to the heavens or earth. Your horse can be present when you do this, but direct your energy to above or below and ask your guides to help you transform them. It is about channeling your emotions. When you are able to channel your emotions you will have access to your own inner power. This is why the true warrior is an expression of pure love.